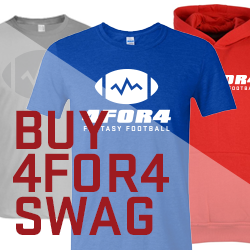 Folks, 4for4 is the only place you can find my Dynasty Rankings! Now, please remember, that these are not static for every dynasty team out there. If you are rebuilding, the younger players might need a little boost up the ranks and obviously the opposite is true if you are in it to win it in right now. But, in a vacuum, here is my list and a great guide for you as a dynasty general manager. Of course the draft will change these dramatically, but trust me, I have done the best I can to account for what we might expect when the draft does take place. If you have any questions, drop me a line on Twitter @WilliamsonNFL to discuss.